This chapter provides a step-by-step tutorial for analyzing a set of virus sequences which have been isolated at different points in time (heterochronous data). The most commonly cited hypothesis of the origin of yellow fever virus (YFV) in the Americas is that the virus was introduced from Africa, along with Aedes aegypti mosquitoes, in the bilges of sailing vessels during the slave trade. Although the hypothesis of a slave trade introduction had often been suggested prior to paper by Bryant et al. (2007), it had not been subject to rigorous examination using gene sequence data and modern phylogenetic techniques for estimating divergence times. The aim of this exercise is to obtain an estimate of the rate of molecular evolution, an estimate of the date of the most recent common ancestor and to infer the phylogenetic relationships with appropriate measures of statistical support. Note: This is the third tutorial in the introductory series. This tutorial assumes that you have gone through the First and Second tutorial on this site and feel comfortable with using BEAUti and BEAST. Run [BEAUti](beauti) by double clicking on its icon. 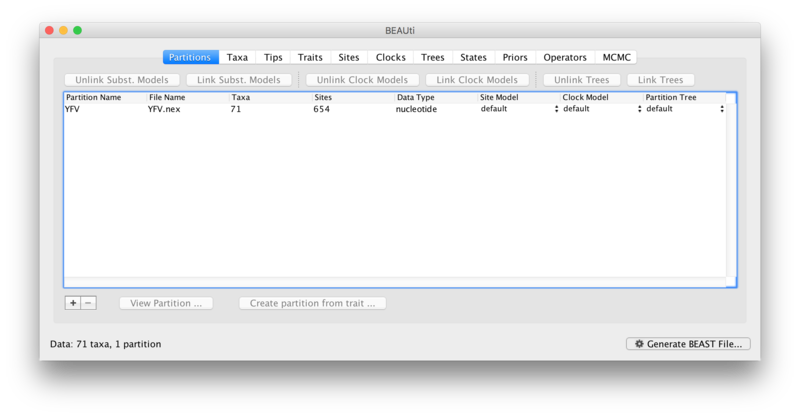 BEAUti is an interactive graphical application for designing your analysis and generating the control file (a BEAST XML file) which BEAST will use to run the analysis. The data file is called 'YFV.nex' and can be found in the BEAST package in the 'examples/Data/' folder or can be downloaded from here. In the next table along you will see the available taxa. Taxa can be selected and moved to the Included taxa set by pressing the green arrow button. 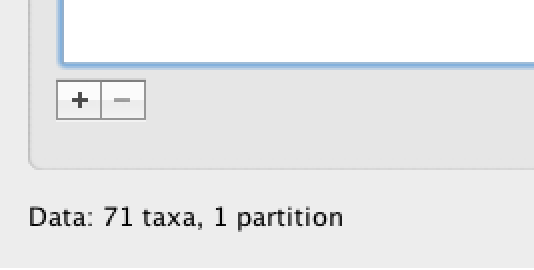 Note that multiple taxa can be selected simultaneously holding down the Command or Control button on a Mac or PC, respectively. Since most taxa are from the Americas, the most convenient is to simply select all taxa, move them to the ‘Included taxa’ set, and then move back the African taxa (the country of sampling is included at the end of the taxa names). Check there are only African countries on the left (there should be 21) and only American countries on the right (there should be 50). The Height column lists the ages of the tips relative to time 0 (in our case 2009). For these sequences, only the sampling year is provided and not the exact sampling dates. This uncertainty will negligible with respect to the relatively large evolutionary time scale of this example, however, it is possible to accommodate the sampling time uncertainty — see here. 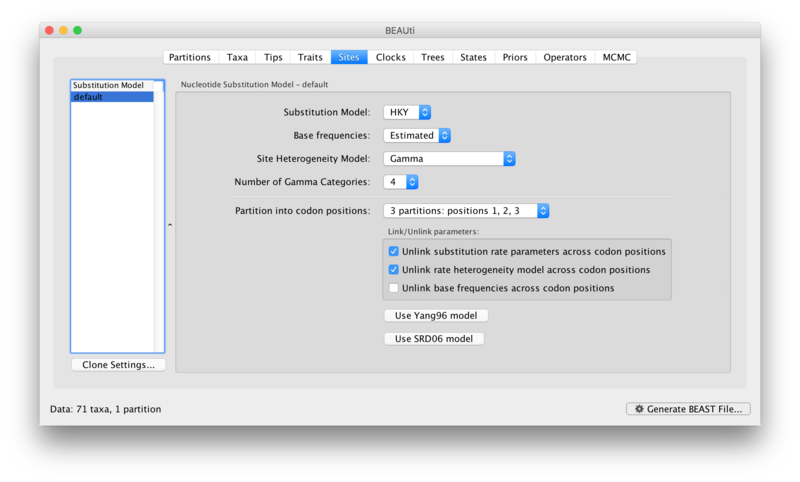 Each parameter in the model has one or more “operators” (these are variously called moves, proposals or transition kernels by other MCMC software packages such as MrBayes and LAMARC). The operators specify how the parameters change as the MCMC runs. As of BEAST v1.8.4, different options are available w.r.t. exploring tree space. In this tutorial, we will use the ‘classic operator mix’, which consists of of set of tree transition kernels that propose changes to the tree. There is also an option to fix the tree topology as well as a ‘new experimental mix’, which is currently under development with the aim to improve mixing for large phylogenetic trees. In the first column are the parameter names. These will be called things like CP1.kappa which means the HKY model’s kappa parameter (the transition-transversion bias) for the first codon position. The next column has the type of operators that are acting on each parameter. For example, the scale operator scales the parameter up or down by a random proportion and the uniform operator simply picks a new value uniformly within a range. Some parameters related to the tree or to the node ages in the tree are associated with specific operators. The next column, labelled Tuning, gives a tuning setting to the operator. Some operators don’t have any tuning settings so have n/a under this column. The tuning parameter will determine how large a move each operator will make which will affect how often that change is accepted by the MCMC which will affect the efficiency of the analysis. For most operators (like the subtree slide operator) a larger tuning parameter means larger moves. However for the scale operator a tuning parameter value closer to 0.0 means bigger moves. At the top of the window is an option called Auto Optimize which, when selected, will automatically adjust the tuning setting as the MCMC runs to try to achieve maximum efficiency. At the end of the run a table of the operators, their performance and the final values of these tuning settings can be written to standard output. The next column, labelled Weight, specifies how often each operator is applied relative to the others. Some parameters tend to be sampled very efficiently from their target distribution (e.g. the kappa parameter); these parameters can have their operators down-weighted so that they are not changed as often. We will start by using the default settings for this analysis. For this dataset let’s initially set the chain length to 100,000 as this will run reasonably quickly on most modern computers. Although the suggestion above would indicate a lower sampling frequency, in this case set both the sampling frequencies to 100. The next option allows the user to set the File stem name; if not set to ‘YFV’ by default, you can type this in here. The next two options give the file names of the log files for the parameters and the trees. These will be set to a default based on the file stem name. 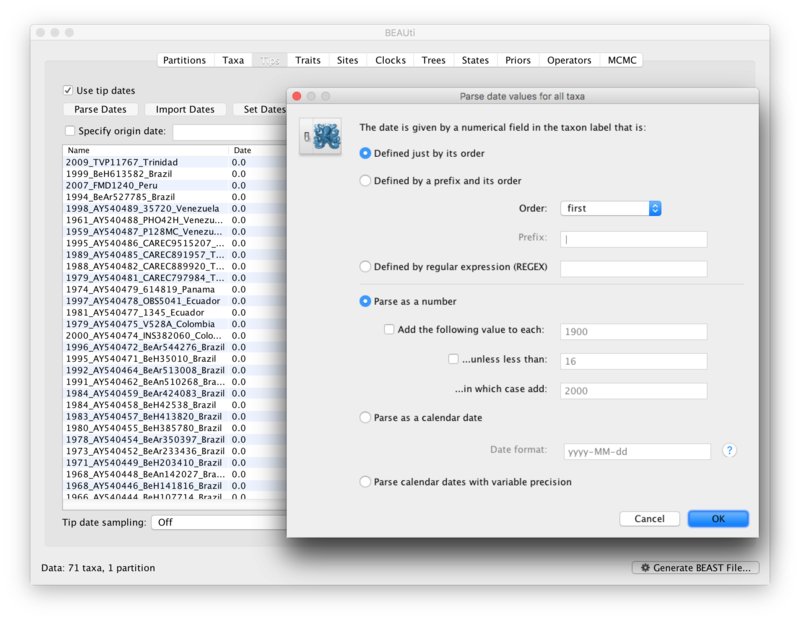 Let’s also create an operator analysis file by selecting the relevant option. An option is also available to sample from the prior only, which can be useful to evaluate how divergent our posterior estimates are when information is drawn from the data. Here, we will not select this option, but analyze the actual data. Finally, one can select to perform marginal likelihood estimation to assess model fit; we will return to this later in this tutorial. At this point we are ready to generate a BEAST XML file and to use this to run the Bayesian evolutionary analysis. To do this, either select the Generate BEAST File… option from the File menu or click the similarly labelled button at the bottom of the window. BEAUti will ask you to review the prior settings one more time before saving the file (and indicate that some are improper). Continue and choose a name for the file (for example, YFV.xml) and save the file. 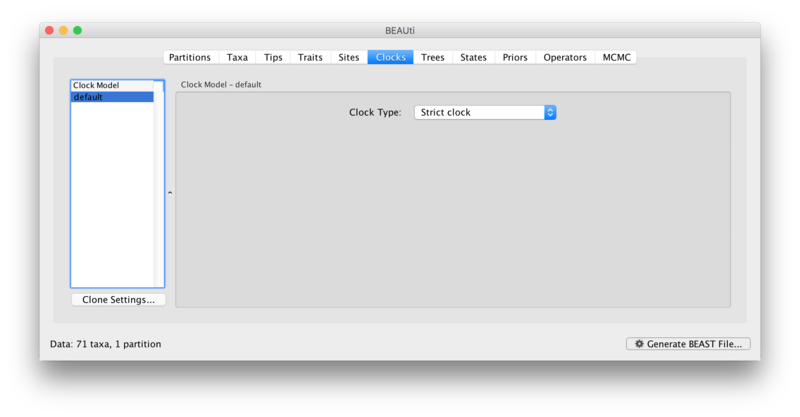 For convenience, leave the BEAUti window open so that you can change the values and re-generate the BEAST file as required later in this tutorial. Once the BEAST XML file has been created the analysis itself can be performed using BEAST. The exact instructions for running BEAST depends on the computer you are using, but in most cases a standard file dialog box will appear in which you select the XML file: If the command line version is being used then the name of the XML file is given after the name of the BEAST executable. When you have installed the BEAGLE library (code.google.com/p/beagle-lib/), you can use this in conjunction with BEAST to speed up the calculations. If not installed, unselect the use of the BEAGLE library. When pressing “Run”, the analysis will be performed with detailed information about the progress of the run being written to the screen. When it has finished, the log file and the trees file will have been created in the same location as your XML file. To analyze the results of running BEAST we are going to use the program Tracer. The exact instructions for running Tracer differs depending on which computer you are using. Please see the README text file that was distributed with the version you downloaded. Once running, Tracer will look similar irrespective of which computer system it is running on. On the left hand side is the name of the log file loaded and the traces that it contains. There are traces for a quantity proportional to posterior (this is the product of the data likelihood and the prior probabilities, on the log-scale), and the continuous parameters. Selecting a trace on the left brings up analyses for this trace on the right hand side depending on tab that is selected. When first opened, the posterior trace is selected and various statistics of this trace are shown under the Estimates tab. The mean value of the samples (excluding the burn-in). The median value of the samples (excluding the burn-in). The central tendency or typical value of the set of samples (excluding the burn-in). The lower bound of the highest posterior density (HPD) interval. The HPD is the shortest interval that contains 95% of the sampled values. The upper bound of the highest posterior density (HPD) interval. Note that the effective sample sizes (ESSs) for all the traces are small (ESSs less than 100 are highlighted in red by Tracer and values > 100 but < 200 are in yellow). This is not good. A low ESS means that the trace contained a lot of correlated samples and thus may not represent the posterior distribution well. In the bottom right of the window is a frequency plot of the samples which is expected given the low ESSs is extremely rough. 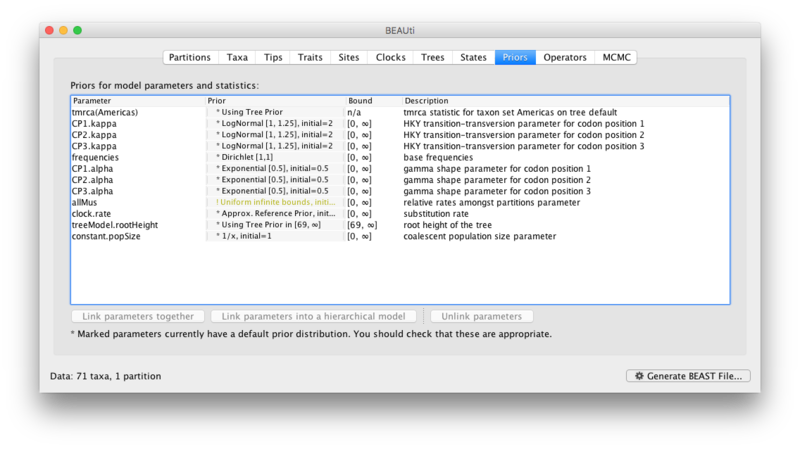 If we select the tab on the right-hand-side labelled `Trace’ we can view the raw trace, that is, the sampled values against the step in the MCMC chain. Here you can see how the samples are correlated. There are 1000 samples in the trace (we ran the MCMC for 100,000 steps sampling every 100) but it is clear that adjacent samples often tend to have similar values. The ESS for the age of the root (treeModel.rootHeight is about 6 so we are only getting 1 independent sample to every 167 actual samples). It also seems that the default burn-in of 10% of the chain length is inadequate (the posterior values are still increasing over most of the chain). Not excluding enough of the start of the chain as burn-in will bias the results and render estimates of ESS unreliable. The simple response to this situation is that we need to run the chain for longer. 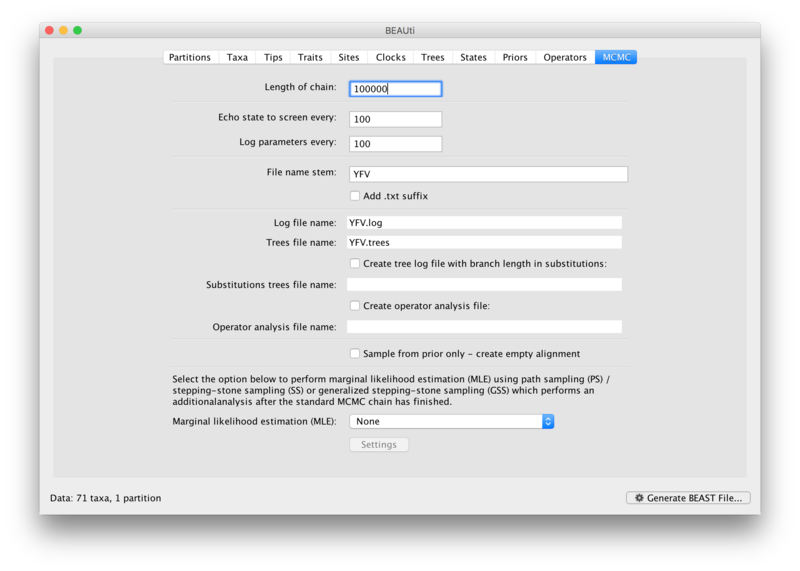 Go back to the MCMC Options section, above, and create a new BEAST XML file with a longer chain length (e.g. 10.000.000). To continue the tutorial without having to wait for a long run to complete, you can make use of the log files provided with this tutorial (chain length of 20.000.000 and logged every 10,000 sample). 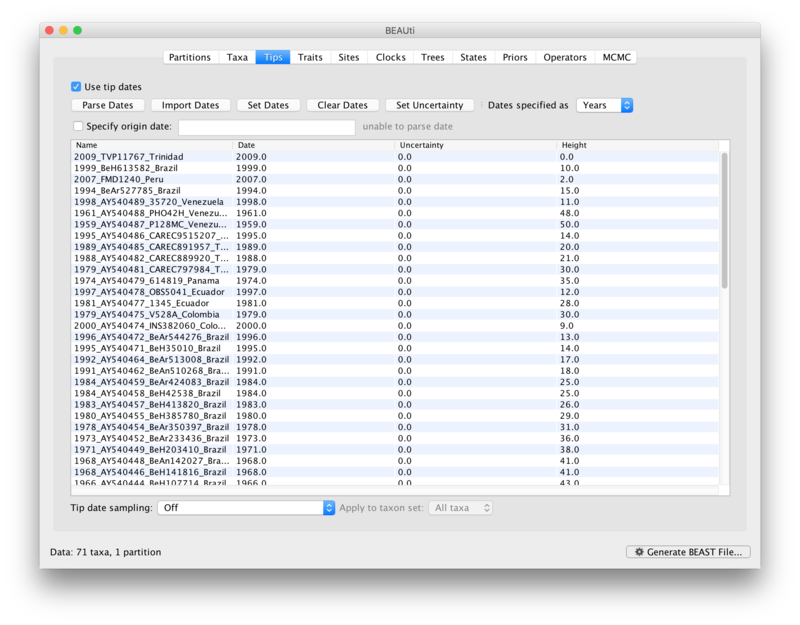 Import the log file for the strict clock analysis and click on the Trace tab and look at the raw trace plot. This indicates that the tmrca for the Americas is significantly younger than the root height and argues for more recent origin of YFV in the Americas. We have seen how we can diagnose our MCMC run using Tracer and produce estimates of the marginal posterior distributions of parameters of our model. However, BEAST also samples trees (either phylogenies or genealogies) at the same time as the other parameters of the model. These are written to a separate file called the `trees’ file. This file is a standard NEXUS format file. As such it can easily be loaded into other software in order to examine the trees it contains. One possibility is to load the trees into a program such as PAUP* and construct a consensus tree in a similar manner to summarizing a set of bootstrap trees. In this case, the support values reported for the resolved nodes in the consensus tree will be the posterior probability of those clades. In this tutorial, however, we are going to use a tool that is provided as part of the BEAST package to summarize the information contained within our sampled trees. The tool is called TreeAnnotator and once running, you will be presented with a window like the one below. TreeAnnotator takes a single `target’ tree and annotates it with the summarized information from the entire sample of trees. The summarized information includes the average node ages (along with the HPD intervals), the posterior support and the average rate of evolution on each branch (for models where this can vary). The program calculates these values for each node or clade observed in the specified ‘target’ tree. Burnin - This is either the number of states or the number of trees in the input file that should be excluded from the summarization. This value is given as the number of trees rather than the number of steps in the MCMC chain. Thus for the example above, with a chain of 20,000,000 steps, a burn-in of 10% as the number of states can be specified as 2,000,000 states. Alternatively, with a chain of 20,000,000 steps, sampling every 10000 steps, there are 2000 trees in the file. To obtain a 10% burnin, set the burnin as the number of trees value to 200. Posterior probability limit - This is the minimum posterior probability for a node in order for TreeAnnotator to store the annotated information. Keep this value to the default of 0.0 to summarize all nodes in the target tree. Target tree type - This has two options “Maximum clade credibility” or “User target tree”. For the latter option, a NEXUS tree file can be specified as the Target Tree File, below. 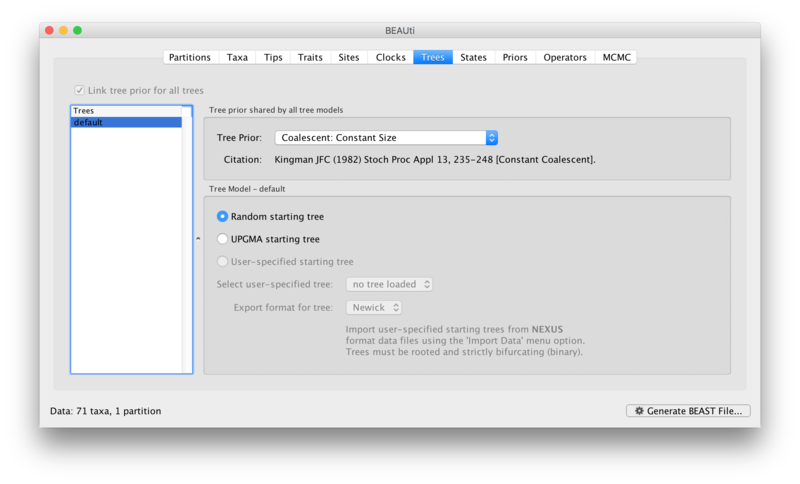 For the former option, TreeAnnotator will examine every tree in the Input Tree File and select the tree that has the highest product of the posterior probabilities of all its nodes. Node heights -This option specifies what node heights (times) should be used for the output tree. If the ’Keep target heights’ is selected, then the node heights will be the same as the target tree. Node heights can also be summarised as a Mean or a Median over the sample of trees. Sometimes a mean or median height for a node may actually be higher than the mean or median height of its parental node (because particular ancestral-descendent relationships in the MCC tree may still be different compared to a large number of other tree sampled). This will result in artifactual negative branch lengths, but can be avoided by the ‘Common Ancestor heights’ option. Let’s use the default Median heights for our summary tree. Target Tree File - If the “User target tree” option is selected then you can use “Choose File…” to select a NEXUS file containing the target tree. Input Tree File - Use the “Choose File…” button to select an input trees file. This will be the trees file produced by BEAST. Output File - Select a name for the output tree file (e.g., YFV.MCC.tre). Once you have selected all the options above, press the “Run” button. TreeAnnotator will analyze the input tree file and write the summary tree to the file you specified. This tree is in standard NEXUS tree file format so may be loaded into any tree drawing package that supports this. However, it also contains additional information that can only be displayed using the FigTree program. Run FigTree now and select the Open… command from the File menu. 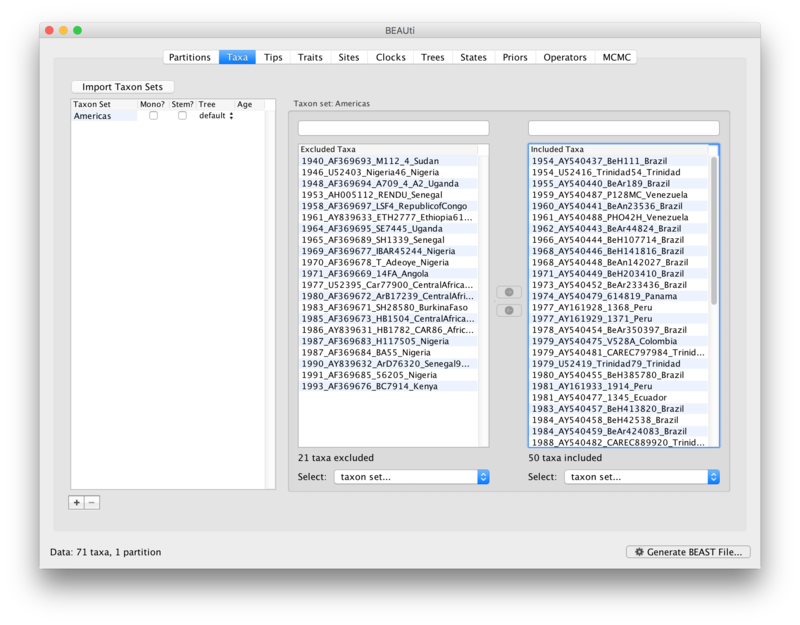 Select the tree file you created using TreeAnnotator in the previous section. The tree will be displayed in the FigTree window. On the left hand side of the window are the options and settings which control how the tree is displayed. In this case we want to display the posterior probabilities of each of the clades present in the tree and estimates of the age of each node. In order to do this you need to change some of the settings. First, re-order the node order by Increasing Node Order under the Tree Menu. Click on Branch Labels in the control panel on the left and open its section by clicking on the arrow on the left. Now select posterior under the Display option. The relative magnitude of such annotations can also be represented by node shapes. We can also plot a time scale axis for this evolutionary history (select ‘Scale Axis’ and deselect ‘Scale bar’). For appropriate scaling, open the ‘Time Scale’ section of the control panel, set the ‘Offset’ to 2009.0, the scale factor to -1.0. and ‘Reverse Axis’ under ‘Scale Axis’. Finally, open the Appearance panel and alter the Line Weight to draw the tree with thicker lines. You can also color clades by selecting a branch, select the ‘Clade’ selection mode and choose a color. None of the options actually alter the tree’s topology or branch lengths in anyway so feel free to explore the options and settings (Highlight or collapse for example the Americas clade). You can also save the tree and this will save most of your settings so that when you load it into FigTree again it will be displayed almost exactly as you selected. The tree can also be exported to a graphics file (pdf, eps, etc.). How do the viruses from the Americas cluster relative to the African viruses and what conclusions can we draw from the inferred time scale?